FOR ALL YOUR FOODIE NEEDS: The Grateful Glamper bamboo sticks were created to be an integral part of all your roasting occasions. 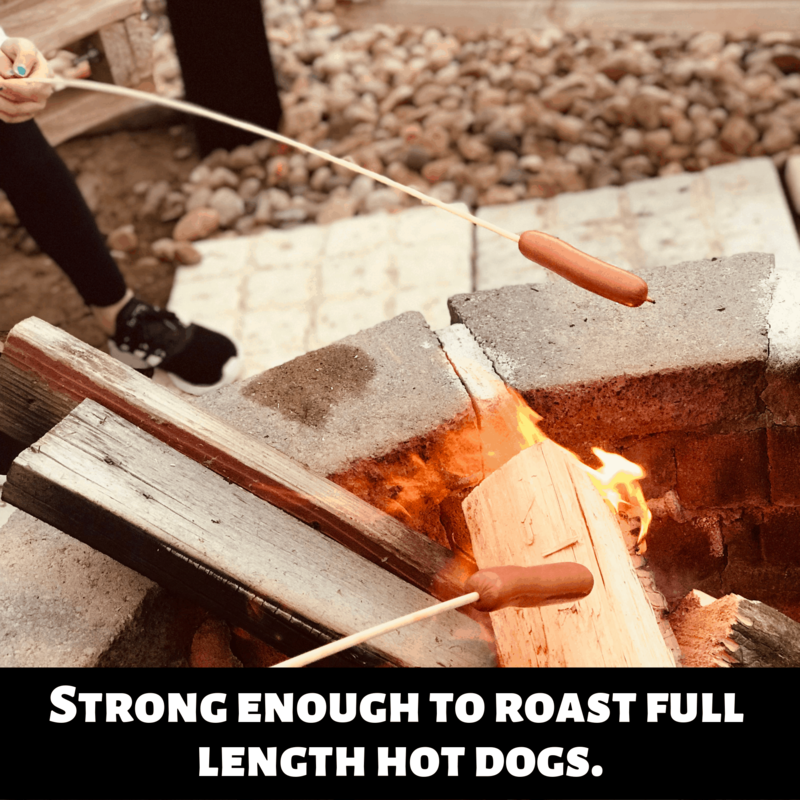 Whether you fire up the barbecue grill, the campfire during your camping/hiking trip or the barrel/ fire pit- our wooden skewers will roast marshmallows, shish kebab sausages, hot dog wieners & any other delicacy or appetizer you can fit on them, safely & perfectly, every-single-time! 110-PACK FAMILY DEAL: With a single purchase you’ll be able to roast away for days! Created to be the perfect value-for-money deal, our wooden barbecue sticks come in the ideal family size, and will be more than enough to last you 3-4 camping/ hiking trips, and even more BBQ gatherings. ACCIDENT-PROOF DESIGN: Coming in at 36” long, our roasting bamboo sticks offer safer handling for avoiding accidents and greater-easier control when barbecuing large quantities that need simultaneous turning. In combination with the whopping 5mm thickness, you get a wooden skewer that’s dependable, handles well & does not break or splinter. ROASTING JUST BECAME SAFER FOR YOUR LITTLE ONES: Keep your little munchkins out of harms way with our extra-large wooden skewers. With a 36” length and a semi-pointed tip design, our bamboo sticks let your kids keep a safe distance from the campfire/pit fire, avoid getting pinched, and ultimately enjoy their roasting time even more! ECO-FRIENDLY BAMBOO MATERIAL: Our wooden skewers are fully environmentally friendly and biodegradable. When you’re done roasting and munching, simply throw our bbq sticks into the fire & they will safely burn away. Never mind about cleaning up or getting all oily as you would with standard metal skewers. Grateful Glamper Bamboo Skewers- Your All-Star, All-Around BBQ “Roaster”! All you need for a good time is to get the fire going and start roasting your favorite delicacies. Our wooden roasting sticks were created for all those occasions, to provide you with a dependable, hassle-free, disposable wooden skewer that you can use safely to roast your food or appetizers. Robust Design- Goodbye Flimsy Mini Sticks! Boasting a 36” length and a 5mm thickness, each bamboo stick feels substantial to hold, allows you full control over your food spinning and above all- keeps you safe from burning accidents. Why do our customers love our wooden roasting sticks? ✔ SAFE KIDS, HAPPY KIDS- Being long enough to stay completely safe from fire, and semi-pointy so that it can hardly cause piercing accidents, our bamboo skewers keep your little ones safe, and out of harm’s way. 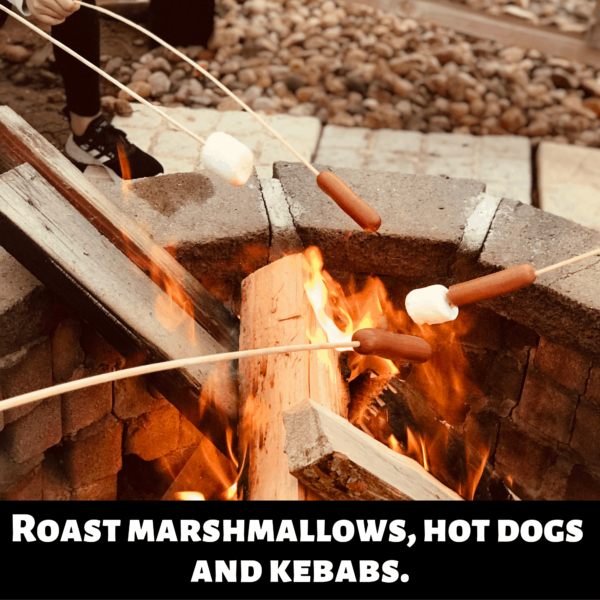 ✔ HIGHLY VERSATILE-For absolutely all your favorite foods- Be it hot dog wieners, shashlik, shawarma, sausages, kebab, marshmallows, s’mores or anything that can go over a campfire and get delicious- our roasting bbq skewers have got you covered! ✔ BEST FAMILY PACK DEAL- With each pack carrying 110 wooden roasting sticks, you get one the best valued offers that will last you for multiple camping trips, family gathers, Sunday BBQs, Weekly Smokers & more! Enjoy full peace of mind knowing that our nonstick, camping wooden sticks are eco-friendly all the way & fully biodegradable, as well as ethically sourced from a sustainable source. So Click Add To Cart Today & Enjoy Quality Time With Your Family & Loved Ones!